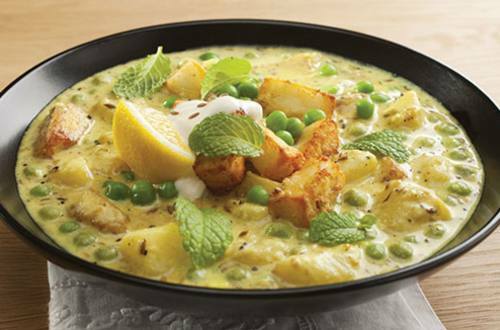 Navratan Korma got its name because you have to use nine kinds of vegetables into the curry. This dish is sweeter in taste because of the cream and cashew paste used in it. 1 Peel off the skin of the potato, carrot and cut into 1/2 inch cubes. Cut the paneer into 1/2 inch cubes and chop the French beans. Boil 4 glass of water in a pan and add potato and beans. Cook covered on medium flame for 5-6 minutes. 2 Then add carrot and cauliflower. Cook covered for another 3-4 minutes till the veggies are properly cooked. Drain the water and keep it aside. 3 Now boil the onion and cashew nuts together into another pan for 4-5 minutes, drain the water and let it cool at the room temperature. Now grind onion-cashew nuts together to make a fine paste. 4 Heat the Pan with oil and add cumin seeds and allow it to splutter. Add Ginger garlic paste and sauté for 30 seconds. 5 Add ground onion-cashew nuts paste and slit green chili. 6 Cook it on low flame for 3-4 minutes. Then add coriander powder, chili powder, 1 Tbsp. of Knorr Chef’s Royal Vegetable Masala and salt to taste. Cook the spices for another 2 to 3 minutes till oil shows separately. 7 Add 1 cup of water (150 ml) and allow it to simmer. Once the gravy comes to boil add the boiled vegetables. 8 Then add raisins and paneer. Cook covered on low flame for 5-6 minutes or till the gravy is a bit thick. Dissolve saffron in two tablespoon of warm milk and then pour it in the kadhai. 9 Add low fat fresh Cream, mix well, Garnish with chopped coriander.